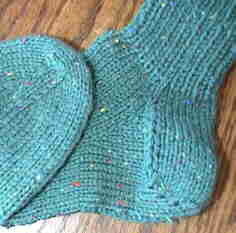 These are socks knitted from the toe up, with a standard turned heel (worked backwards). 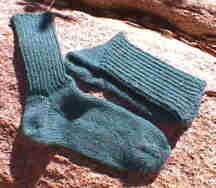 The pattern began as an April Fool's Day joke for the knitlist -- the joke being that when finished, they look exactly like the very plainest of socks. The name comes from this joke, plus the fact that you can try them on as you go to check the fit of the foot. The pattern has a couple of other advantages. The method of casting on at the toes means that grafting the toes together is not necessary (however, an additional joke is that the best way of binding them off is like grafting 40 stitches instead!). Also, the upper part is done last, so if you're running low on yarn you can get the feet done on both socks first before doing the tops. Set of 5 double-pointed needles, size 5 or 6 (US). If you use 4 dp's, you'll have to be very careful on the increases, which are described in terms of needle numbers. Gauge: about 5 1/2 stitches per inch, which is tighter than is usual for this weight yarn. Note: I use a lifted increase for the toe and gusset increases, because I like the control over which way the new stitches slant away from the old ones. This is made by lifting the loop from the back of a stitch one row below the row you are knitting. You may substitute your favorite inconspicuous increase, such as lifting the bar between the two stitches below, twisting and knitting through it (often called "make 1"). Based on the method used in Anna Zilboorg's Fancy Feet. For a nice, clear explanation of how this is done, see Kim Salazar's Simple Toe-Up Socks. Hold two dp needles parallel and wrap the yarn in a figure-eight, making 8 loops on each of the two needles. To do this, hold two needles parallel in the left hand, and also hold the tail of the yarn. Pass the working end of the yarn over the top needle away from you, through the middle toward you, under the bottom needle away from you, and through the middle toward you, until there are 8 loops on each needle. Don't tie or twist the end of the yarn--just let it hang loose, so you can tighten up the cast-on later. Next, knit around the 16 loops, being careful not to split the yarns of the cast-on row. The first eight stitches will be hanging the "wrong" way, so you'll have to knit through the back leg of the loop. The second eight will be hanging the right way. When you have finished this round you'll have two needles, each with 8 stitches, and the cast-on row between them. Needles 1 and 3: k1; lift the stitch below the stitch on the left needle and knit it; k to the end of needle. Needles 2 and 4: k to within 1 st of end; lift the stitch below the stitch on the right needle and knit it; k1. Repeat these two rounds until there are 10 stitches on each needle (40 stitches in all). Knit on 40 stitches, trying on the sock from time to time until you reach the point where the leg meets the top of the foot. This is about 3 to 3 1/2 inches less than the total length of the foot. End at one of the sides of the foot, that is, above one line of toe increases. The rounds begin at the next needle, which will be called needle #1. The stitches on needles 1 and 2 are the sole of the sock, and on needles 3 and 4 are the instep. Needle 1: K1, lift the stitch below the stitch to the left and knit it, k to the end of needle. Needle 2: Knit to within 1 st of end; lift the stitch below the stitch just knitted and knit the lifted stitch, k1. Needles 3 and 4: Knit plain. Round 2: Knit around plain. Repeat these two rounds six times altogether. Needles 1 and 2 have 16 sts, and needles 3 and 4 have 10 (52 sts in all). Knit 10 stitches from needle 1 onto needle 4. SSK (that is, slip 1 st as if to knit, sl 1 as if to knit, knit these 2 sts together through back loop), k 4 from needle 1 and 6 from needle 2 onto the heel needle. Slip the remaining 10 sts from needle 2 onto needle 3. There are now 20 stitches held on each of needles 3 and 4; you will work back and forth on the heel needle only. Row 1:Turn, P2 tog, p across row. Row 2:Turn. SSK, k across row. Repeat these two rows until 4 stitches remain, ending with a wrong-side row. Turn, sl 1, knit across heel. Pick up 7 stitches by knitting along the decrease edge. Turn. Sl 1 as if to purl, p back across the heel and pick up 7 stitches by purling along the other decrease edge. Turn. You now have 18 sts on the heel needle. You will be knitting the heel flap upward, incorporating one stitch from the adjacent instep needle each time you turn. Row 1:Sl 1 as if to knit, k across row to the last st. Sl 1, sl 1 from the next needle, k these 2 together through back loop. Turn. Row 2:Sl 1 as if to purl, p across row to the last st. Sl 1 as if to p, sl 1 from the next needle, p these 2 together. Turn. Repeat these two rows for a total of nine times, ending with a purl row. You should have 40 stitches (18 on the heel needle and 11 on each instep needle). Turn, sl 1, and knit a full round, adjusting stitches so that there are 10 on each of four needles. You're on your own from here! A few rounds of stockinette and then K1P1 ribbing all the way will work--or anything you like. A good height for a sock cuff is the same as the length of the foot, longer if you want to fold it over. If you will be using a standard cable bind-off, bind off in pattern as loosely as possible, either giving each loop a tug to lengthen it as you pull it through, or using a needle a couple of sizes larger for the binding off. A more elegant and elastic (and need I say, difficult?) way of binding off a ribbed edge is to use what Montse Stanley (Reader's Digest Knitter's Handbook) calls the "Tubular Bind-Off," and Vogue Knitting book calls the "Knit one, purl one bindoff." This is a variant of the Kitchener Stitch, or grafting method used for sock toes.